The resistance will not be televised. 10 years ago, aliens came to Terra Firma with the idea in mind of improving our planet, and in turn, we’d give them many of our resources. And to an extent, they did, lowering crime rates, instituting a stable world structure, and one-party politics. However, not all is well, and the gap between the haves and the have-nots has only widened, along with the presence of a watchdog government. Humans—and particularly, those in the Chicago area—are prisoners in their own place; even if they don’t feel they are. Not everyone accepts this fate of futility in the present day. Some, such as Gabriel Drummond (Ashton Sanders) fight as a part of a resistance known as “The Phoenix,” seen as terrorists to those in power such as Officer William Mulligan (John Goodman). Foe a decade, The Phoenix has laid down the groundwork to shake up the system, and now it’s time to carry out those blueprints. Light a match, ignite a war. Remember Kin, a kind-of-cool-yet-many-genres-at-once movie from last year? Less than six million total in its box office run strongly says no. 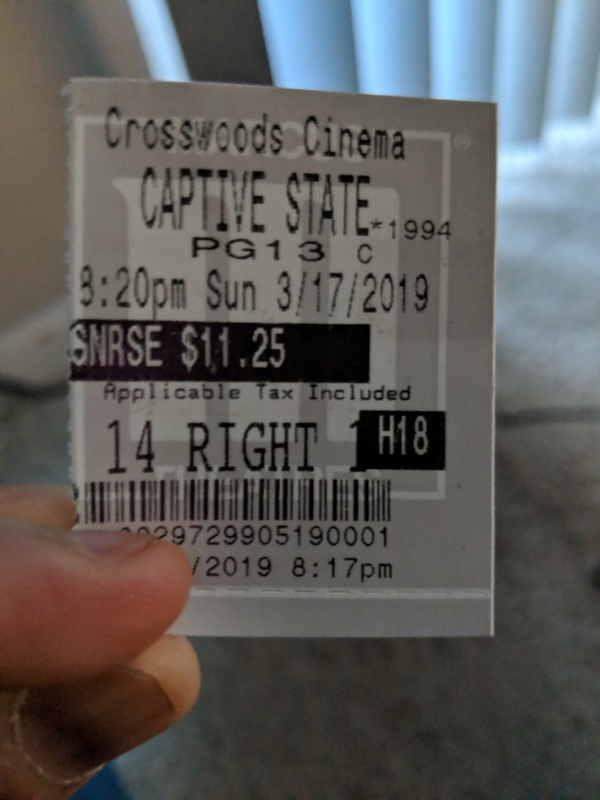 Captive State is somewhat of a doppelgänger, sharing some of the same problems in addition to an eerily similar box office opening week performance (Kin finished with $3,035,618, Captive State with $3,131,525). Where the two movies differentiate is that Captive State, not without some sizable sinkholes and curious choices, has a stronger idea overall of what it wants to be, though the execution leaves a viewer wanting. It feels as if director Rupert Wyatt has been around for ages, directing a bevy of films. The reality is, Wyatt is not some old hand, with his debut occurring slightly over 10 years ago with The Escapist and only directing three features since then—one being The Gambler, and the other birthing one of the best trilogies of all time in Rise of the Planet of the Apes. On the latter alone the talent is there, and it is seen heavily at times during Captive State, beginning with a chaotic opening scene. While the rest of the film doesn’t quite match the “Wow!” intensity of the opening, Wyatt (when not drowning the palette with drab gray) is able to string together stretches of intensity and immersion, not to mention a unique alien design. He’s supported heavily by the efforts of composer Rob Simonsen, quickly solidifying himself as one of today’s best. Captive State in many ways is the inverse—or maybe just the “proper verse?” of Neill Blomkamp’s sci-fi classic in District 9 with a small bit of Cloverfield. The former movie, unlike this one which sees the aliens overtake an area immediately, saw aliens come from their homeland and into Earth, where they were imprisoned and had no rights. Hardly original, but the way Blomkamp told pieces of that story through a documentary approach allowed his alternate world to feel like a real thing throughout; additionally, it enabled any pertinent questions or plot points in desperate need to be expounded on get addressed. Captive State is missing the clear storytelling to make itself memorable, falling victim to the phrase critics love so much in “failed potential.” Similar to Kin, it is fair to wonder if this potential would be better served in a television series, having the time to explore all of the coded communication, the many years/steps that the aliens took to overthrow the longstanding system, why so many humans seem to be compliant, and the lot of characters and their relationships to one another; many of whom are needless and eventually dropped, sometimes quickly. Wyatt does manage to pull off a nice end reveal that, had more emotional links been established, could have raised the movie up a notch. Sanders can be a star, and one could argue that out of the three-headed troika of actors who played Chiron in Moonlight (all were great), his portrayal as a confused, conflicted teenager was the most affecting and powerful. Unfortunately, his role here isn’t going to be what fast-tracks his breakout, through no fault of his own. He’s written as a supporting character in a movie where he’s supposed to be the lead, and Wyatt along with co-writer Erica Beeney make a grave mistake by pivoting away from his journey for a long chunk of the run time right when things start to get interesting. Their move leads to a great moment but messes up the pacing for a solid 20-30 minutes before it happens. He’s not being stretched, but Goodman is good, man, which is nothing surprising. There’s a really good science-fiction tale somewhere in Captive State, but the final product is what it is. Not quite a critical state, just somewhere between serious and fair. Photo credits go to focusfeatures.com, hollywoodreporter.com, and inverse.com. Great review! I hate when good potential is wasted in a movie, but your words intrigued me, I think I’ll try to check this one out. Thanks! No problem, definitely wait for streaming. Bummed that this didn’t turn out good. I almost went and saw it last week but the earl reviews scared me away. Seems like a good sci-fi flick is there somewhere. It’s a shame we didn’t get that. It was actually one of my most anticipated of the year. It just came out…average. It’s weird, I always had this belief that Wyatt was some really good director, but he only has 1 great movie out of four and even that was the weakest of the trilogy.